During my travels to Alaska and Canada over the years I became infatuated with simple carvings of the native art of the Eskimo people that inhabit the northernmost regions of Alaska and Canada. This month’s sculpture is a derivative of my impressions of what I experienced on these journeys and how the members of this indigenous people, known as Inuit’s, influenced my latest work. 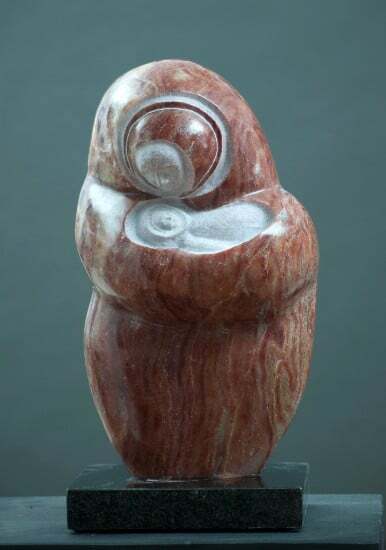 I selected raspberry alabaster as my medium because of its warmth and how the green striations feel almost like a blanket of softness around mother and her child. The details of the sculpture were enhanced by using a different surface technique. Please enjoy the feeling of love.